A gorgeous member of the daisy family, marigolds are herbaceous annual flowers that are easy to grow and even easier to enjoy. Marigold flowers were used by the ancient Romans to signify the start of the new moon cycle, and have historically been used in religious ceremonies as well as for culinary and commercial purposes. While calendula marigolds are considered the most medicinally beneficial variety of this plant, each kind of marigold offers distinct advantages to any homesteader. Marigolds offer a variety of benefits, from pest control to culinary applications, making them a plant that every homesteader should grow. Even if you’ve never grown marigolds before, you’ve likely noticed them in other peoples’ gardens. Ever wondered why this flower is so popular? 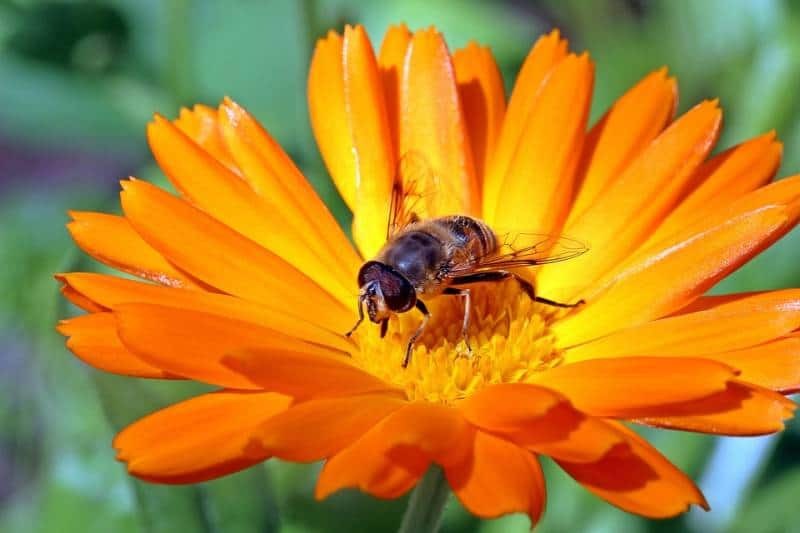 Marigolds attract bees and other beneficial pollinators, while at the same time acting as a pest deterrent. Marigolds provide a pop of color to your garden, attracting beneficial pollinators such as honey bees and butterflies. To attract pollinators with marigolds, plant a dense row of the flowers along the edge of a garden or flower bed. Marigolds can also be interspersed among other plants, but growing them in thick clusters will provide a vibrant pop of color—and act as a potential food source for welcomed pollinators. Try to select scented and single-flower varieties of marigolds when planting, as these are the most attractive varieties for bees. To make the most of this, try planting a dense row of marigolds around the edge of a garden or bed. Since marigolds can be grown in just about any soil type, they will happily grow alongside each of the crops mentioned above. They provide a variety of benefits, such as protection against beetles, nematodes, and beet leaf hoppers (who hate marigolds). Because marigolds have such a strong scent, most pests (with the exception of beneficial pollinators) will stay far away. However, when using marigolds as a companion plant, you do need to pay extra attention to the size of the plant. Marigolds range in size from six inches to three feet, so make sure you pick a plant that will work with the rest of your garden or bed. You also need to make sure that the plants are grown in full sun and well-drained soil. Marigold flowers bloom in a variety of different shades, but the most common are orange, yellow and red. Unlike many other flowers, marigolds have such a unique vibrancy, and can brighten up any corner of your garden. Make the most of the many shades of marigolds by purchasing a variety pack of marigold seeds. 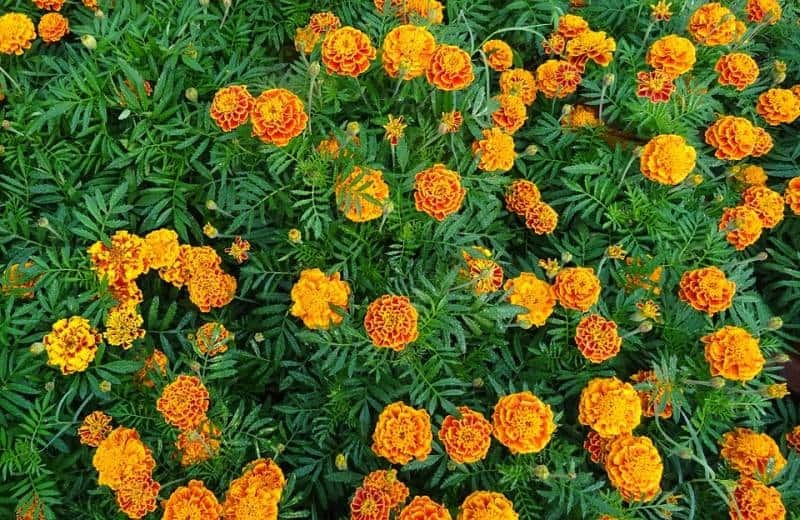 Generally speaking, the conditions required to grow marigold mixes or separate varieties don’t vary, so it makes it simple to grow multiple varieties alongside each other. Many people do not realize that marigolds are actually edible, making them a perfect addition to an edible landscape or a kitchen garden. 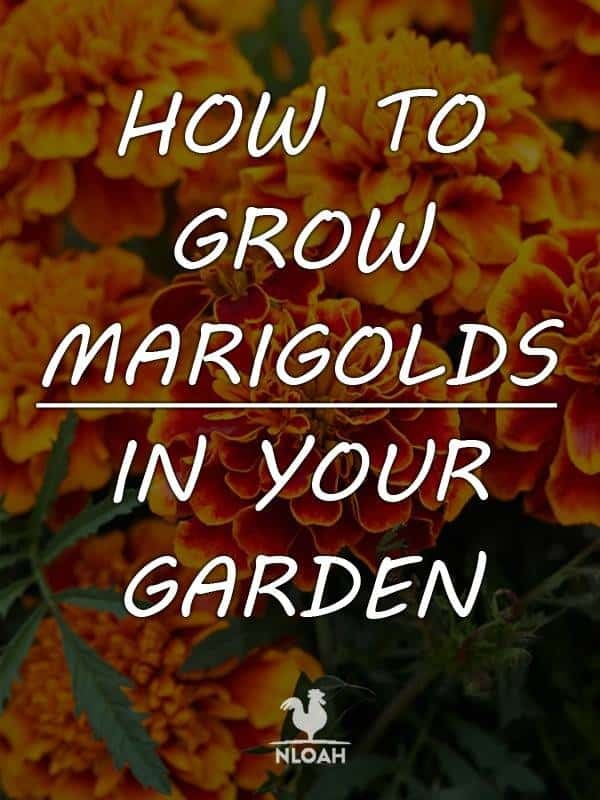 While not all varieties of marigold are edible, there are so many that are, so you will not have a problem finding varieties to grow if you want to use your marigolds in the kitchen. It is the bright orange petals that are the edible part of the flower, and the easiest way to prepare these is to add them raw to salads, and any other dish that needs a pretty garnish. The taste of the petals is mild, with a slight peppery kick, which is why many compare the taste to that of arugula. You can also dry the petals and grind them into a powder. You can add these to dishes as a substitute for saffron. In fact, marigolds work so well in this application that they are often referred to as poor man’s saffron. Fresh marigold petals can even be brewed into a tea. The taste of the tea will be quite mild, so you may want to mix in another herb or two as well. Of course, any marigolds that you use in the kitchen should have been grown organically, and you should steer clear of any unopened or wilted flowers. Keep in mind that any fertilizers or insecticides you may have used can be harmful to your health, as well as the taste of the flowers, and should be avoided as a result. In addition to adding some extra visual appeal to a dish, marigolds are also extremely nutritious, especially when it comes to Mexican marigolds. Packed with antioxidants, phytochemicals and flavanols, many of the compounds found in marigolds are currently at the center of scientific research. Results are favorable, with evidence that marigolds can treat everything from HIV to asthma. Marigolds have been used medicinally for centuries by cultures all over the world. Also known as calendula, the active ingredient in marigolds has strong antibacterial properties and also contains plant sterols, polysaccharides, flavonoids, and tocopherols that help the body function appropriately. Marigolds can be used topically for many different purposes:Thanks to its anti-inflammatory properties, marigolds can treat a range of skin conditions, including acne, dermatitis and diaper rash. It can help with dry skin and sunburns, and can even resolve blisters. It speeds up wound healing and ulcerations and has powerful antibacterial properties that can help to prevent an infection. You may also make a tea from marigold flowers, which has been proven to help reduce symptoms caused by digestive issues like colitis and inflammatory bowel diseases. Marigolds can even help treat acid reflux and menstrual cramps. Calendula extract can also treat conjunctivitis and other eye problems, as the flower helps reduce inflammation. Marigolds actually help to protect vision in the future as well, working to strengthen delicate eye tissues and prevent UV damage. Calendula drops can help decrease inner-ear swelling and inflammation, largely because it has antiseptic properties. Marigold, or calendula, drops can help boost your immune system, preventing and treating coughs and sore throats. Marigolds can even be used to promote tissue healing and help reduce haemorrhoid pain. They work to close wounds and sanitize the area. Marigolds can be used to treat fungi infections when ground into a salve. Common fungal infections include those in the eyes, mouth, skin, or feet, with marigolds even treating build-up of candida in the body. Calendula has dozens of active chemicals that make it a natural cytotoxic. 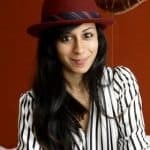 This means it can help to lower inflammation and prevent free radical damage, reducing symptoms associated with chemotherapy and other cancer treatments. 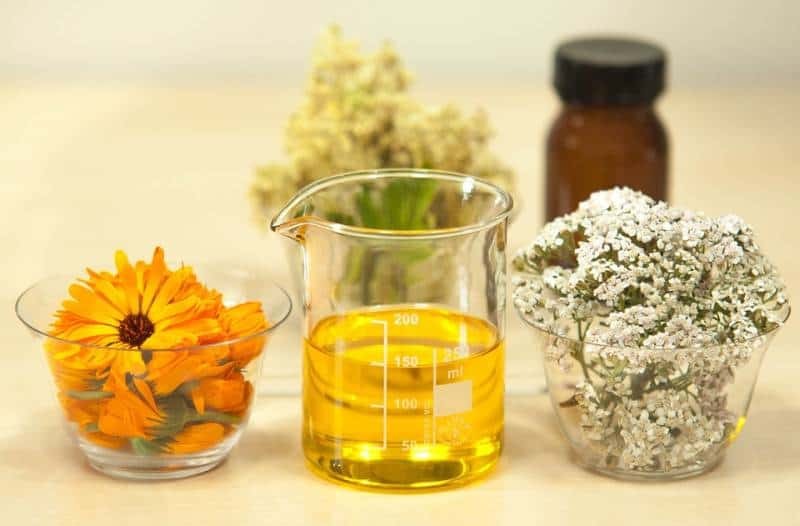 The best way to use marigolds topically is by creating an oil infusion. There are different methods for doing this, but cold infusions tend to be best, as these do not use heat, and therefore do not deplete the medicinal properties of the flowers. Cold infusion oils may sound complicated, but are actually extremely easy to make. First, place some marigold petals into a clean glass jar. The amount of petals you use is completely up to you, and you should try experimenting with different amounts. The more petals you use, the more of the final product you will produce. Then, fill the jar with oil so that the petals are fully submerged. Coconut, almond, or sunflower oil make excellent organic oils, but the type does not matter. Use whatever you have around the homestead. Leave the mixture in a sunny spot and allow it to infuse undisturbed for up to four weeks. Then, strain the petals and store the oil in an airtight container. It should last for up to a year. When taken orally or applied topically, marigolds help the body heal and detoxify, providing health benefits to the entire body. Many people expect all marigolds to smell the same, but different varieties of marigolds can actually have quite distinct scents. Their scent is due to a substance called turpene, which all marigolds contain, but in different amounts. From the lemon and mint scented Mount Lemmon Marigold to the anise-like scent of the Mountain Marigold, it is worth exploring the many different scents out there, as you will likely find quite a few that you love. One of the main benefits that marigolds have over other flowers is the fact that they have such a long blooming season. Seeds germinate quickly, meaning that you can have marigolds outside in your garden from spring all the way until the fall. Of course, just like with any plant, there are ways to extend the blooming season of marigolds. This is discussed in more detail below. There are 56 different species of marigolds, and these can be grown all over the world. Everybody grows marigolds for different reasons. Marigolds have so many different uses, so the varieties that you pick need to be ones that will do the job that you have in mind for them. African marigolds – these plants grow up to about 36 inches tall, making them great for decorative background or border plantings. They have large yellow and orange double flowers, and are also referred to as American marigolds. French marigolds – these are smaller and bushier plants, with many varieties featuring bi-colored flowers. These marigolds are tolerant of rainy weather, and flourish in containers and window boxes. Signet marigolds – lemon-like in scent and tarragon-like in flavor, this edible variety is quite small and bushy, with single flowers. Tangerine scented marigolds – a large plant that is actually a perennial in zones eight and warmer. Cottage red marigolds – a hybrid flower that was first bred in Mexico. Growing up to five feet tall, this variety featured bright red petals with yellow edges and a gold center. 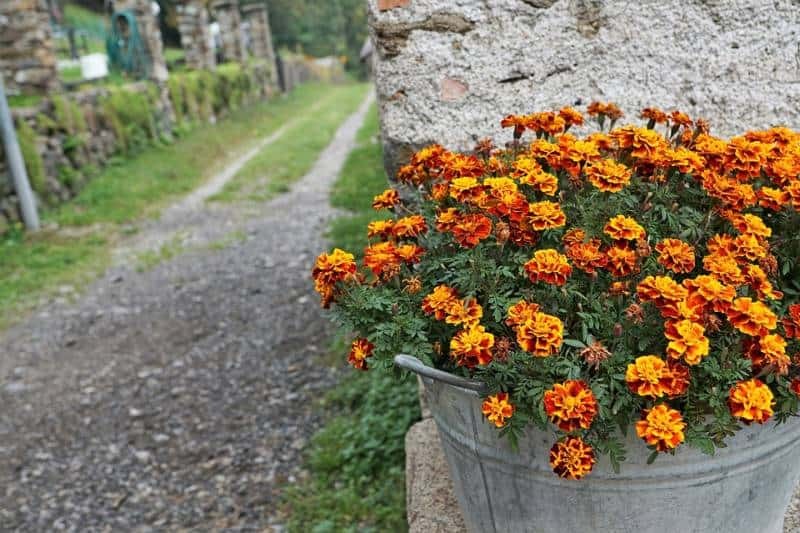 Discovery orange marigolds – a vigorous plant with large orange flowers. Doubloon marigolds – extremely weather resistant, this is one of the hardiest marigold varieties. The sturdy stems support large, double yellow flowers, and seem to stay standing upright no matter the weather. Sweet cream marigolds – produces elegant, cream- colored flowers that attract birds, bees and butterflies. 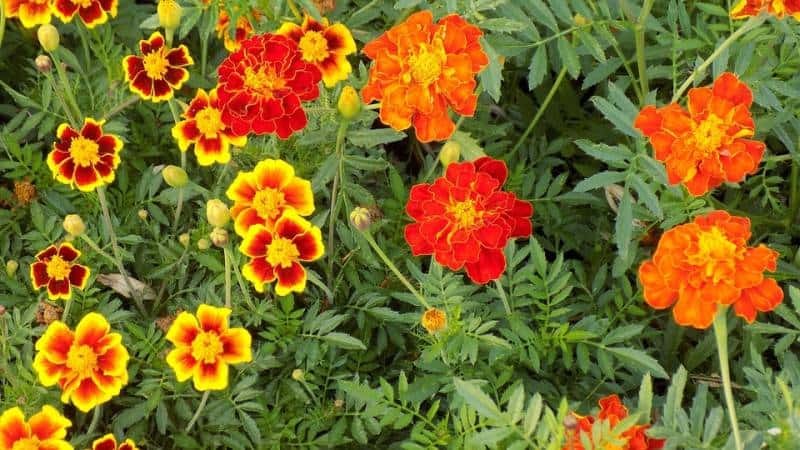 Safari red marigolds – a hybrid variety that is great for deterring nematodes. The flowers come in deep shades of red and orange, making them perfect for cuttings and bouquets. Pot marigolds – also known as calendula, pot marigolds are not botanically related to marigolds, but have many of the same properties. As mentioned above, marigolds are an easy and low-maintenance plant to grow. Although they are mostly unable to withstand frost, they can tolerate a wide range of temperatures. They do thrive in full sunlight, but this is not necessary, and even if kept in partial shade, you will still have a display of flowers throughout the summer months. You can grow marigolds in just about any soil type, which is why they are such a popular companion plant for so many different crops. In fact, marigolds often do better in poorer quality soil, because rich soil causes plenty of lush foliage, without many flowers. However, the soil does need to be well-drained in order for your marigolds to really flourish. When it comes to site preparation, there is not much that you need to do. A granular fertilizer in the planting hole can be helpful, but, as mentioned above, marigolds prefer poorer soil. This allows the flowers to flourish instead of the foliage. Marigolds do not require special attention when it comes to watering, either. However, they do not like water-logged soil, so you need to make sure that you allow the soil to dry out between waterings. Watering the plants at their base, rather than from overhead, is always better, and you should increase the frequency that you water them if you are experiencing particularly high temperatures. If you have planted marigolds in your garden or vegetable bed, consider installing a drip line system of irrigation, or laying down mulch, to better moderate the soil. Marigolds are so easy to grow that they can be used to teach children how to grow plants from seed. Sow seeds indoors, and water them occasionally. That’s all there is to it! However, if you don’t have the time or space to start seeds indoors, you might consider purchasing a few plants instead. 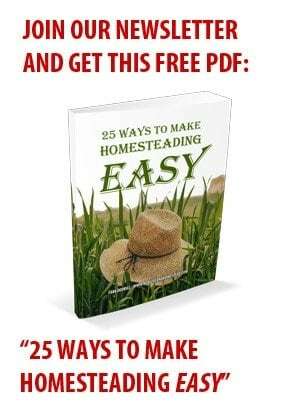 This is often the preferred method for homesteaders who are not interested in sowing seeds directly. As mentioned above, marigold seeds can be sown directly outside, although you will need to wait until the soil has warmed up slightly. In warm soil, the seeds will germinate outdoors in just a few days, with flowers appearing about eight weeks later. Of course, starting your seeds off indoors, about six to eight weeks before your last expected frost, means that you will have a supply of marigold flowers throughout the growing season. To do this, prepare seed trays with about four inches of potting soil. Moisten the soil completely and then make small holes in the soil throughout the tray, spacing them about an inch apart. After placing two seeds into each hole, cover the hole with a thin layer of soil. Cover the trays with plastic, as this helps to speed up germination, but be sure to remove the plastic as soon as you see the first sprout appear. If you don’t, mold might appear. Place the trays in a warm and bright spot, and then wait a few days for the sprouts to appear. Leave the seedlings in their warm and bright spot, and ensure that the soil does not dry out. However, wet soil also needs to be avoided, as this will lead to stem rot. Once the seedlings have developed their first set of true leaves, you will need to thin them out. Make sure that you do not pull the seedlings out, as this will disturb the others. Instead, snip them at soil level with a pair of scissors. If you notice that the seedlings on one side of the tray seem to be growing better than the seedlings on the other side, this could be due to uneven light distribution. A simple fix to this is to rotate the trays each day, as this alternates which plants are closest to the light source. Once your seedlings are about four inches tall, it is time to think about transplanting them, but remember that this needs to be after your last frost. In order to prepare them for transplantation, it would be worth spending a couple of weeks hardening them off. All this consists of is moving the trays outside, beginning with an hour a day and slowly increasing this to full days and then nights as time goes on. Hardening off your marigolds ensures that they will be acclimated to the outdoor weather conditions, including cool breezes and driving rain, and helps to prevent transplant shock. Prepare the new site for your marigolds by digging the soil about six to eight inches down, as this will loosen and aerate it. Remove any stones and then set each plant into a hole that is about the same size as its root ball. Space the plants about ten inches apart, although you will need to increase this if you are growing a larger variety of marigold. After planting your marigolds, use your hands to firm the soil around the roots, as this will help to give the plants a bit of extra support. Then, thoroughly water each plant. While mulching is not essential for marigolds, this does help to keep the surrounding soil clear of weeds, while also maintaining soil moisture. All you need to do is spread some organic matter, a couple of inches thick, around the bare soil that surrounds your marigolds. This is easiest done when your plants are still young, before their foliage has become too bushy. Once your marigolds begin to flower, you may wonder how to extend their blooming season. Since marigolds naturally have a long flowering season, there is not much that you need to do, but there are a few steps that you can take to prolong their life even more. The first is by deadheading any flowers that have run their course. To do this, examine your plants for flowers that have begun to turn brown, or whose centers have started turning green, as this means that they are preparing to go to seed and are going to stop blooming soon. Follow the stem down to the first set of leaves, and then snip the stalk off just above this. This area will continue to produce more stems and flowers. Just make sure that you do not damage the leaves If you have any stems that are growing too long, and therefore look quite weak, these can be snipped off, too. This will help the plant to grow bushier, while producing more flowers. Any diseased or damaged flowers or stems should also be removed. Another tip, especially for those who are growing taller marigold varieties, is to utilize staking. This will help the plants withstand bad weather, keeping your plants much healthier overall. Make sure that your stakes are a few inches shorter than the height of your marigolds once you have put them into the ground, so that the flowers will hide the stakes. Many people think that feeding their marigolds will extend their blooming season, but, as mentioned above, this only encourages foliage growth, and does nothing for the flowers. You are best off to refrain from feeding your marigolds, as they really do not need it. Whether you are using them live or dried, marigolds are perfect for flower arrangements, and, when growing them in your garden, it only makes sense to make the most of these gorgeous cut flowers. The best time to harvest marigold flowers for bouquets is early in the morning. Choose flowers that have only just opened, and immediately place the stems into a jar of water once you have cut them. Then, arrange the flowers in a vase with some water, which you will need to change every day. Make sure that you strip the stems of their lower leaves, so that you do not have any leaves touching the water. Your marigold flowers will last for around a week, or even longer if you add a floral preservative to the water. For dried arrangements, harvest flowers when they are at their peak, as this is when they will look their very best. Cut away any foliage and hang the flowers upside down in a cool and dry place. The flowers will shrink a bit, so you may want to choose larger blossoms for this, but the color will remain just as vibrant. Marigold seeds are so easy to collect and save, so it would be a shame to let them go to waste. In the fall, you will notice that flowering begins to slow down. While you will want to keep deadheading your flowers in order to extend their growing season, you should now also leave a few spent flower heads on the plant, so that they can produce seeds. 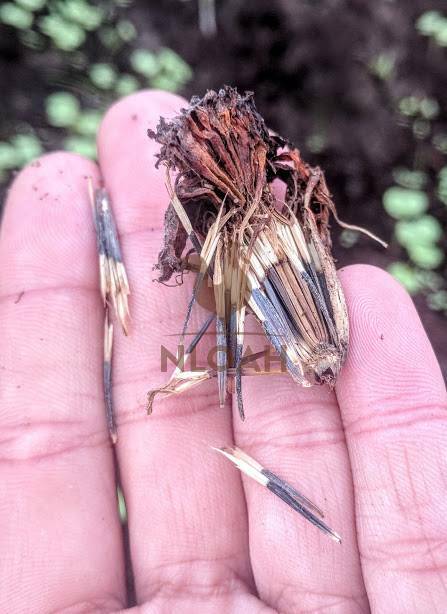 You will then need to wait until the flower heads go from green to completely brown, as this is then a sign that the seeds are mature and ready to be collected. 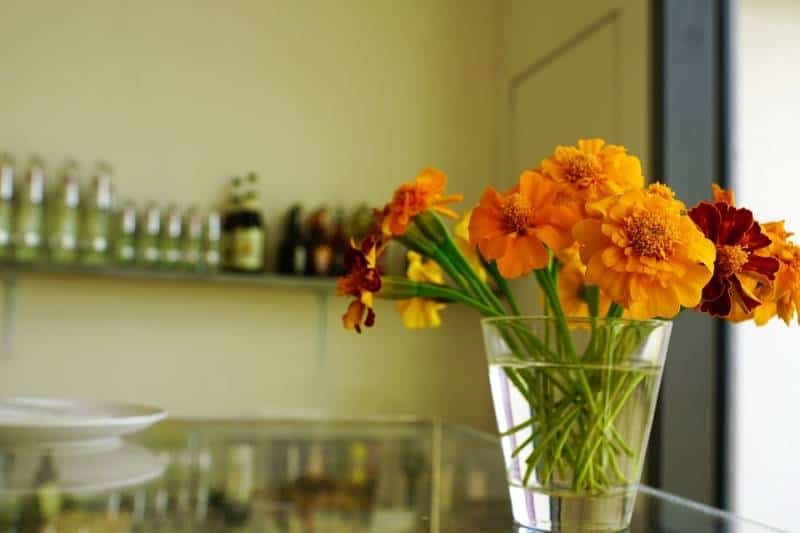 Hold a marigold blossom by its petals, over a paper towel or a plate. With your other hand, slowly pull the flower head apart, and you will find that a number of seeds quickly and easily fall out. Of course, there will be plenty that are still stuck to the petals, so you will also need to gently separate these. Spread the seeds out in a single layer on a paper towel, and place it in a warm and dry spot, with good air circulation, for a couple of weeks. Make sure that they are away from direct sunlight, as this can damage the seeds. Once the seeds have dried, they can be placed into an air-tight container until the next growing season. Marigolds are such a strong and hardy plant that they are rarely bothered by pests or diseases, especially since they are a great form of pest control by their very nature. Powdery mildew –This can be avoided by watering your plants at their base rather than from above, and ensuring that your soil has good drainage. Flower bud rot – This type of rot can also be avoided by watering at the base. Leaf burn – If your marigold leaves begin to turn yellow and die, this could be because of excess nutrients in the soil. As mentioned above, marigolds prefer poorer quality soil. Leaf miners –These pests lay eggs in marigold foliage, with the larvae then “mining” its way through it the leaves. Leaf miners target weakened and stressed plants, so keeping your marigolds healthy should be enough to deter these pests. Snails and slugs – These will target your marigold seedlings, so either protect your seedlings or do some research into snail and slug control, as these pests will also quickly damage other important plants in your garden. As with any plant, if you notice any sign of disease, you will need to immediately dispose of the whole plant to prevent it from infecting the plants around it. Do not place diseased plants in your compost bin, as you do not want the disease to spread into your compost and surrounding soil. Marigolds are one of the most popular flowers grown by homesteaders, and for good reason, too. Consider planting them this spring for color and health benefits that last the entire summer and fall. 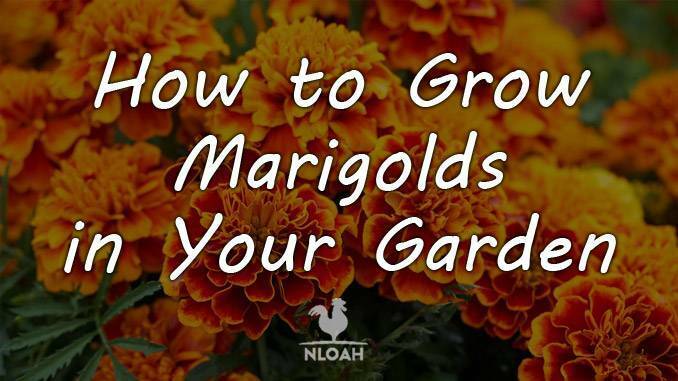 Do you grow marigolds in your garden? If so, we would love to see some pictures! Please share them with us, either in the comments section below or on our Facebook page.